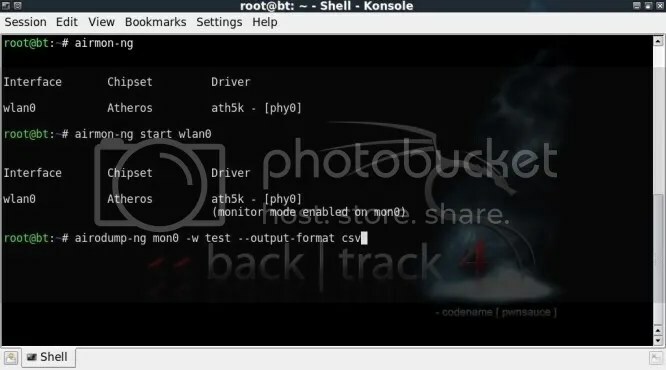 Originally designed as a word list creation tool, thad0ctor’s BT5 Toolkit has become an all purpose security script to help simplify many Backtrack 5 functions to help Pentesters strengthen their systems. y = The number of characters the words/passphrases in the wordlist have. 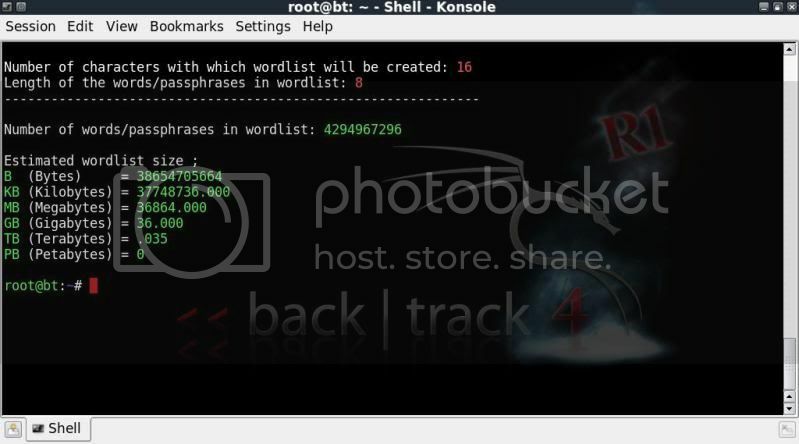 so 16 characters in total, and we want to calculate based on a wordlist wherein the passphrases have 8 characters. You cant choose to check what the results would be with any fixed patterns, or variables, (have to leave the hard stuff like that to the pro’s !) 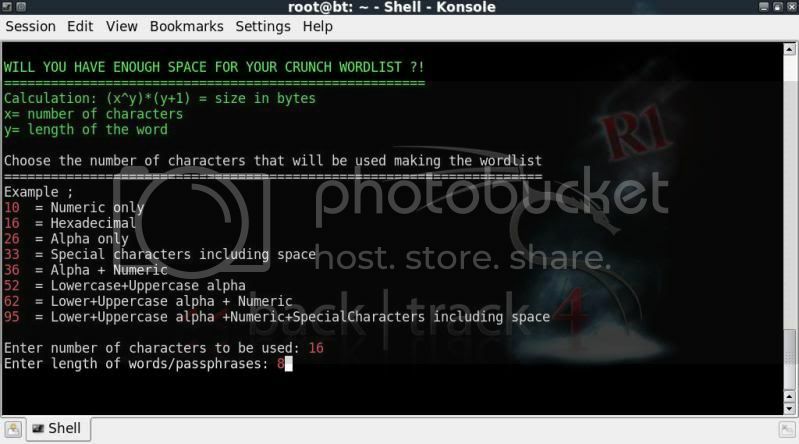 but it is still an eye-opener to see the sizes involved with a ‘simple’ wordlist. Please comment if I messed up on the calculations anywhere..
Airdrop-ng is described as being a ‘rule-based Deauth(entication) tool’. 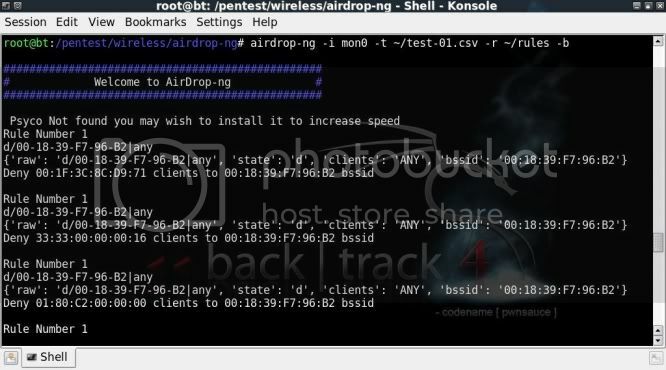 Different from other deauthentication tools, Airdrop provides a means to either allow or deny clients to the same access point at the same time, as well as other nifty functions such as allowing or denying access based on hardware type (hardware name or OUI). This allowance or denial is based on rules which are entered in a text file read by the application. 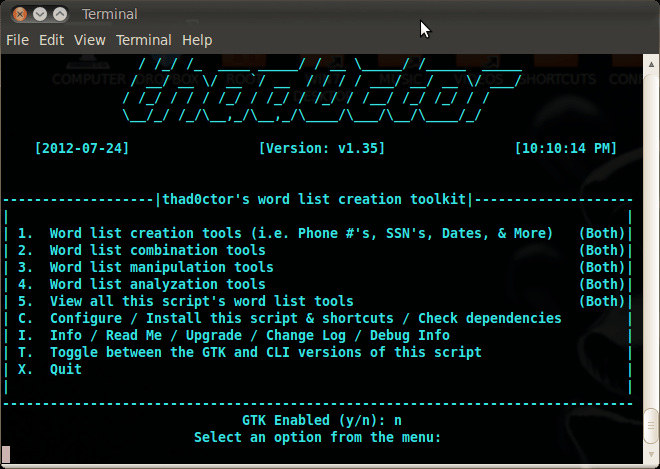 The way it works is fairly staightforward, first airodump needs to be started, configured to write out to a .csv file. Then airdrop is started, linking to the csv file and pointing to a rules configuration file where the drop rules are entered. So the main thing is to figure out what you want to achieve with this tool running, prepare the file with drop rules accordingly and then let it rip ! Now to create a file with the Airdrop drop rules. In the written examples I am using 00-11-22-33-44-55 as AP mac and 55-44-33-22-11-00 as Client mac. Some of the actual picture examples show different macs addresses as these are taken from an actual test run requiring actual connections. This rule will deny all clients access to the AP with mac address 00:11:22:33:44:55. 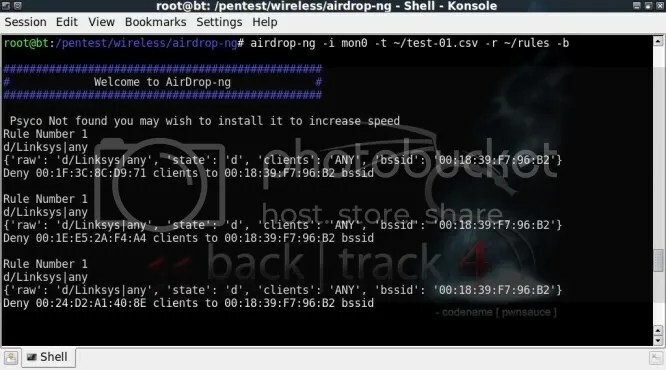 With the above when running airdrop, all clients except 55-44-33-22-11-00 will be denied access to AP in question. There is no real need to include “#Allow rule” and the “#Deny rule”, its just for clarity’s sake. Another nice function is the ability to Allow or Deny access to certain hardware based on OUI codes or (some) hardware names. 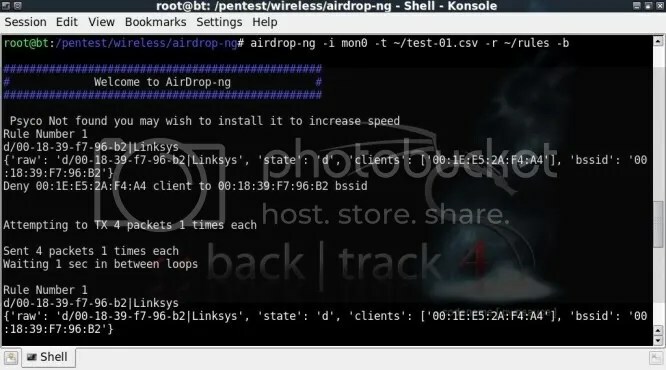 I have only tested this using names on my network with Linksys and Intel equipment. 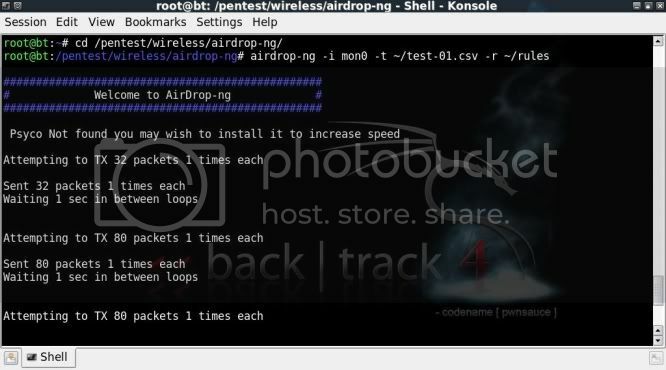 Each time Airdrop finishes sending packets it re-parses the airodump csv file for changes as well as the rules file, this means that the rules file can be updated even while Airdrop is running.